← Are Organizations Really Less Agile Today? In agile documentation is minimal, yet not any less important. Because you use fewer words and artifacts to define something, those you use become more important! Every project, regardless of whether it is a software development effort or laying a rug at your church, should begin with a project charter. A simple (one page) project charter contains a short, clear and inclusive narration of what you are going to do and why you are going to do it (include motivating factors in this justification). It also defines any available budget and budgetary constraints. Any time or resource restrictions are noted as well. From this charter, create a simple project definition in some repository (likeMicrosoft’s TFS or something more agile friendly). The project definition gives you a place holder for organizing all releases of the effort together in one spot. Now define several releases for the effort. Three being the optimal number. Remember, you don’t have to get these perfect. You can refine them later. Concentrate on getting done what is critical to the basic functionality first. Have each release span about 3 chronological months. Thinking in terms of bitesize chunks is critical to keeping deliverables flowing and adhering to the Pareto principle. While you are developing these releases, create storyboards, in some wireframing tool, that define the basic scenarios of use needed in each of the releases. Note each subsequent release will probably consume storyboards from a previous release. When you are writing the product and release definitions, use language that your end user or consumer would use and understand. These definitions should become the basis for marketing. And if you were so unforgivable as to not have the marketing and sales people involved earlier, now is the time you must do so. 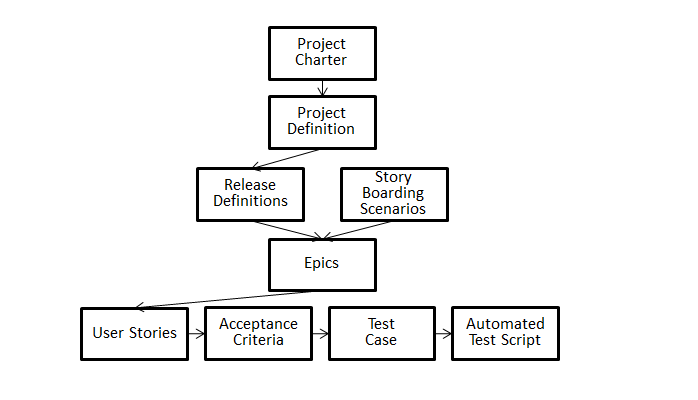 Break down each release into a set of epics or very high level user stories that have more to do with flow and high level features, rather than individual functions. Note each subsequent release will probably consume epics from a previous release. You are now ready to define the individual atomic functions necessary to implement each epic. Express these as well worded user stories that follow the Gherkin language and adhere to the INVEST principle. Make sure each user story has clearly derived acceptance criteria associated with it. They must be understood by the product owner, developer and tester alike. From the acceptance criteria the dedicated testers should develop specific test cases. These should then be automated, wherever possible, in a set of test scripts to promote ease of full regression testing. You are now ready to go into release planning, followed by iteration planning. Generally, it works best if you have three iterations, each 4 weeks long for each release. Ideally, the last week being a hardening off time where no new development takes place only bug fixing. In each step of the way, you can go back and make revisions to a higher level expression. For example, when you are defining the releases, you will gain greater insight into the overall product definition and might need to go back and add to, delete from or modify the language used there. Nothing is written in stone as the old saying goes. You should be taking in new knowledge all the time and leaning as you go, resulting in a better product. Practice economy of writing. Never use 10 words when 5 will do as well. Practice uniformity of language. Use the same terms throughout with everyone. The best terms are the ones the user will recognize. Don’t get hung up on any one step. Often a subsequent step will aid you in understanding a previous one. So move on, then go back and correct. If you are new to agile or even experienced some form of orderly progression like this will help you organize your efforts and keep them on track. Let me know what works for you! Till next time, Keep Agile! This entry was posted in Agile and Strategic Planning, Agile for Beginners, Agile for Software Development, Agile in the Enterprise, Uncategorized and tagged Agile, Agile Methods, Agile software development, scrum. Bookmark the permalink. This is similar to what we have been doing for years and it works fine. No need to make it more complicated. Nice explanation Brian. I love your blog and hope you post more along this practical advice when following scrum.